Interesting post from Hugh Howey about editing, today’s reader, and the modern expectation of perfection in writing. A quick overview covering how amazing things are to how much of the industry is in flux. It’s now so much easier to reach so many people, and the internet has opened up so many new channels for creators, but new struggles have emerged. I am wary of the phrase “trigger warning”, and I’m glad to see Neil Gaiman is with me. I highly recommend checking out this post from his new book Trigger Warning: Short Fictions and Disturbances . In this excerpt Neil explores how fiction is supposed to push us, teach us things, and help us grow. Fellow author and writing group pal, Michael Ripplinger, explores a specific story arc—the return of an ancient evil—that attracted him to writing. It’s always fun recognizing these sort of things in our writing. Last weekend we didn’t have a Friday Link Pack because I was heading down to Portland for CthulhuCon. How did it go? Fantastic! I break it down in this post, hit the highlights, and share a few pictures. I love monsters. Who doesn’t? So I was on board when I saw Damon Hellandbrand‘s take on the familiar zodiac signs. Libra is my favorite. So one of Kari-Lise and my favorite artists is Seamus Conley. There’s something so emotional in every one of his pieces. His latest series, Catch My Fade, currently being show at the Andrea Schwartz Gallery in San Francisco, California is nothing short of amazing. I really enjoy these recover contests that the Fox in Black does occasionally. They’re really handy for indie authors to get some good ideas on cover designs, plus you always find some really beautiful pieces. April’s contest for re-covering Hemingway’s The Old Man and The Sea is no exception. Not everyone is a fan of brutalism, but I am. There’s something so combative about the buildings, something arrogant. I love the brash unapologetic retro-future style. In this article Dezeen Magazine explores brutalism architecture, and discusses how we should preserve the legacy. These vintage PSAs from the U.S. Army shows their focus of stamping out VD. They are amusing, terrifying, and well… a bit strange. It’s interesting how it seems to point the finger at women and not the male soldiers who were the guys actually doing most of the sleeping around. Ah, good ol’ sexism solidly alive and well in postwar America. Barzai the Wise and his disciple Atal climb a mountain to gaze upon the gods of the earth and discover more than they bargained for. It’s been awhile since I’ve done a news update. Looking back the last time I updated everyone on the progress was back in December. So yeah, time to rectify that. A lot of things have been happening and I am excited about 2015. We’re so close! I can almost taste it. The teaser site for Red Litten World has been live for a while. But I haven’t really called attention to it. You can see what’s happening over on redlittenworld.com. We’re going back to Lovat, people. We’re getting close! As of a week ago I handed the manuscript of Red Litten World over to my editor. Now the hard/fun part begins. The manuscript topped out at 105,823 words which makes this the longest in the series so far. But, I’m sure a big chunk of those will get cut. (That’s a good thing.) Really excited getting into this portion. I’m planning a post about my CthulhuCon schedule later this week. But since it’s coming I did want to hit on some highlights. I’m going to be on a panel! I will be participating in the Creating a Mythos panel, alongside some incredibly talented people. Names like: Leslie S. Klinger, Ross E. Lockhart, Wilum H. Pugmire, Justin Steele, and Sean Hoade. As with every con you’ll be able to pick up copies of The Stars Were Right and Old Broken Road, and I’ll have Bell Caravan patches available. Likewise I will have a bunch of free swag: buttons, stickers, and a ton of bookmarks. Come on by my table in the dealer room and say hello and grab a copy of a book! So I have been pretty quiet on O.D.E.. So quiet in fact I haven’t really revealed the title! But that’s all going to change real soon. I’m nearly finished with the first draft, and the cover is coming along, and I am pretty excited about the project as a whole. It’s refreshing to write a standalone story. As I have mentioned in the past, this is much different from The Bell Forging Cycle but it’s a cool world with some engaging characters wrapped up in an intense story, I think you’ll dig it. More to come later. If you’re a watcher of my project tracker, you’ll have noticed that I am working on a novella title: The Faults of Man. This is intended to be a short story set in the Territories but not told from Wal’s perspective. I’m keeping a lid on the plot right now (you’ll have to wait until Red Litten World arrives) but the idea is this will take place during the events of Red Litten World and will focus on some familiar characters. So over the weekend I did a reading. I had a lot of fun doing it, and got a pretty warm reception. Kari-Lise suggested I keep doing it, and I thought it’d be fun to make it a weekly thing. Maybe read through The Stars Were Right. I mention it here to really judge the reception of that. If you think it’s something I should do, shoot me an email or leave a comment below. If there’s enough interest we’ll make it a regular thing. So there’s the spring update. My writing is all in a weird spot, as you can see there is a lot of things coming, but nothing is quite here. That said, a big part of writing is pushing through, and I’m going to keep on pushing. Thanks to all my readers and fans for sticking around, it’ll be worth it. Recently I became aware of 38Long’s Hemingway Editor. Over the weekend I had a little time and I figured I’d download it and give it a try. I was really pleased with the result. Taking it’s name from Hemingway himself the software goal is broad: it works to make your writing bolder and clearer. As you can see it’s a thorough and useful piece of software. There’s a few minor bugs with the way tooltips hover, but nothing that makes the software unusable by any means. 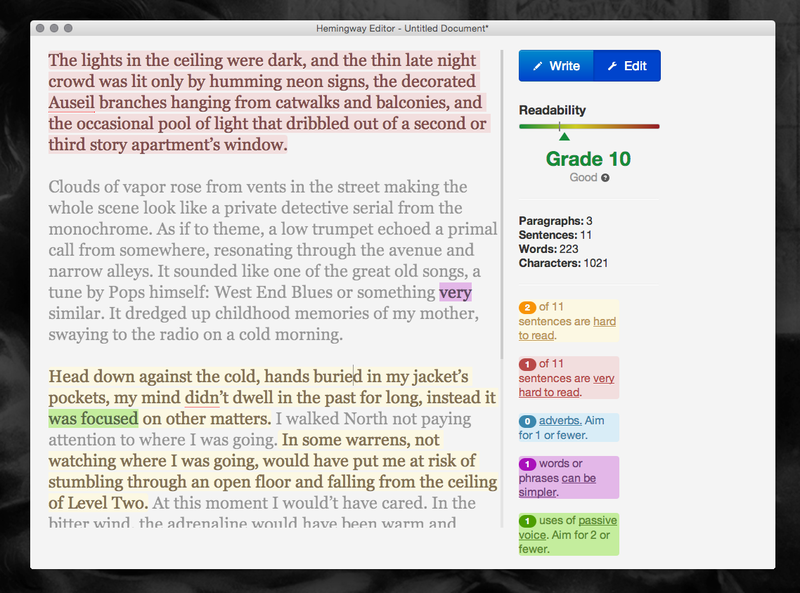 While not a replacement for a real human editor, it’s a good sanity check for writers, and for the low price of $6.99 for the PC/Mac desktop version it’s worth every penny. The Hemingway Editor also has a free version online, you can check it out at: hemingwayapp.com. Try it yourself, see if it’s something that you’d incorporate into your own workflow. I know it’ll have a place in mine.